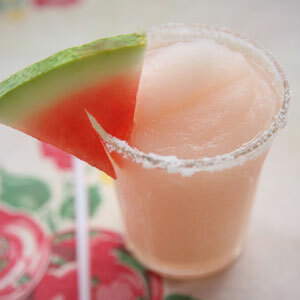 Watermelon gives this Margarita, from Austin's Fonda San Miguel, its refreshing kick. I have also used fresh pineapple in this recipe. What gives it a really great flavor is the fruit infused tequila. I steep mine up to two weeks and check it starting the 5th day to determine when it has the finest flavor. From Saveur Magazine. Photo by Andre Baranowski. 1. For the infused tequila, cut a watermelon into 1" cubes (rind removed) until you have roughly 2 lbs. of fruit. Transfer to a glass jar, pour in tequila, seal jar, and let steep for 2 days. 2. To make drinks, combine the watermelon-infused tequila, 2 cups crushed ice, frozen limeade, infused watermelon, and Cointreau in a blender. Purée until slushy. Garnish with watermelon wedges.